I did my first triathlon, and I had a blast. I think my adrenaline was pumping for at least an hour after finishing the race. It was hard to relax actually because I was just so pumped up. My wife valiantly fought her way around the course to take photos. In fact, I think her legs were more sore than mine. Thanks, Honey! 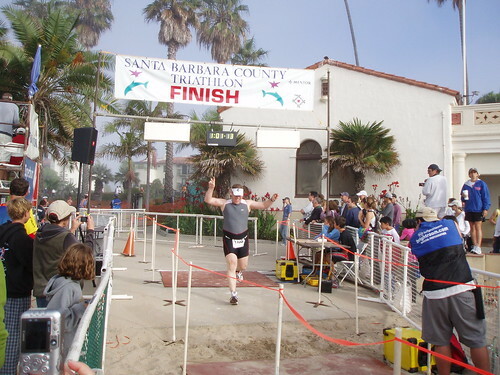 The race was up in Santa Barbara, about 2.5 hours north from where I live. Because I would have to be at the race site at around six in the morning, I decided to get a hotel, and because all the hotels required a two night minimum stay, we made a vacation weekend out of it. I was signed up for the sprint on Sunday, but there was a long course race on Saturday, so I looked forward to seeing that as well. 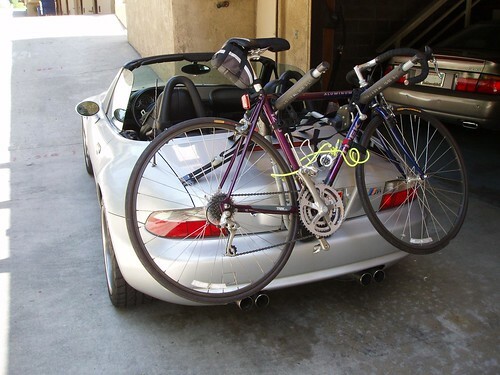 I loaded up the car and secured my bike on my bike rack. We had to be really careful what we brought since my car does not have a lot of space, be we made it work. Friday night we had dinner with a group from the LA Tri Club. They were all doing the long course the following day and were all in carbo-loading mode. Of course I just had to have the big bowl of pasta! Saturday we watched the long course event and cheered on fellow LA Tri Clubbers. Two of the guys I swim with on Fridays in the Pacific Palisades won their divisions, so that was really cool. I was really surprised how long some of the racers took in transitions. Some would change out of their swimsuits or slather on sunscreen. Hello! This is a race. 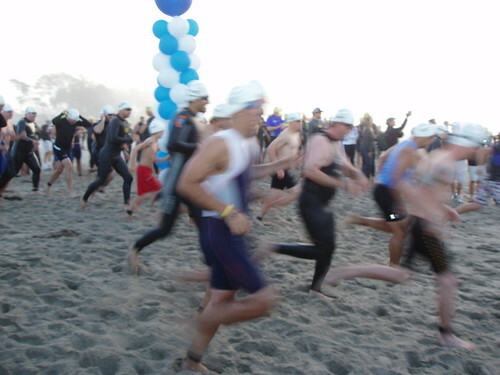 Race in tri-shorts, and put your sunscreen on before the swim. I was just surprised that so many participants did not seem to have very quick transitions in a race that probably does not attract many first timers. The long course is nearly half ironman in length, which is just too long for first timers. That night I was very excited, so I didn’t sleep very well. I got up extra early and rode my bike down to the race site and arrived at 5:30am. It was dark and only a couple of other people were there yet. I set up all my gear and got numbered and then put my wetsuit on. I debated for a long time whether I should even use my wetsuit. The water was cold, but not so cold that I couldn’t tolerate the short 500 yard swim. There also would not be any speed advantage to wearing the wetsuit, since any gain would be lost in the time it takes to take the suit off in transition. I was primarily concerned that my arms would get tired since the suit is rather tight in the shoulders, and I had difficulty getting the suit off quickly in the past. Ultimately I decided to wear it after all because I figured my time should not be a priority since I would be in the back of the pack anyways, and it would give me more practice in taking my suit off during race conditions. For the start we lined up on the beach between two towers of balloons. I was in the first wave with the young, fast guys. I stayed to the back and to the left since we would be turning right at the buoy and I didn’t want to get crushed. Turns out that it happened anyways. After turning past the first buoy I was flanked on either side by swimmers going about the same speed as me. But as we went along the guy on my left kept moving right and the guy on my right kept moving left. I kept getting squashed between them. I mean really! It is a big ocean people! Here we were just three swimmers, and these two have to keep getting in my way. I just responded by trying to out swim them and give no quarter. The guy on my right pulled ahead after rounding the last buoy and the guy on my right overshot the last buoy and ended off course. I think coming up out of the water was probably the hardest part of the triathlon. Coming out of the water, you feel a bit dizzy and weak, but it was not that bad. I credit my frequent open water swims with helping with that. What is hard is the fact that you have to run up a hill of sand, while at the same time taking your wetsuit off my upper body. It feels like you are just inching up the beach, but my heart rate monitor was showing my heart rate going sky high! I think my heart rate monitor captured a rate of 184 beats per minute. I didn’t even know that my heart rate went up that high! 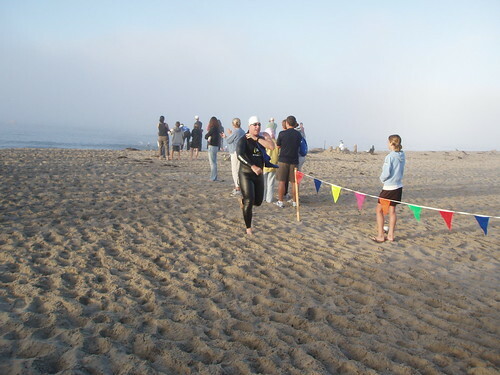 My swim time for 500 yards (and running up the beach) was 13 minutes and 31 seconds, which was 173rd out of 294 participants (59 percentile). By the time I made it to the transition area I was out of breath and felt really weak. Trying to get my wetsuit fully off was difficult because my legs felt too tired to hold up my body weight, and my arms were shaking and felt too tired to get the tight rubber wetsuit off of my wet legs. I thought to myself that I was really in trouble because the race had just started and I was so weak. But I just did my best and eventually got it done. next up was putting on my bike shoes and helmet. Getting my socks on was also difficult because I was trying to stand on one leg and my balance was off one. It seemed that T1 took a long time, but it wasn’t too bad. Total time was 2 minutes and 32 seconds. I ran up to the street guiding my bike, and I was very fortunate that I had put the pontoons on my SPD cleats. These are just rubber bumpers on the side of the cleats that allow you to walk in the bike shoes. I hadn’t really thought about it before, but you really have to run quite a ways with the bike and without the pontoons I would likely slip. Unfortunately the pontoons make it difficult to engage the cleats into my pedals. I have Ultegra SPD pedals, which are designed specifically for the pontoons, but they still are a little tricky to engage. So when I first got on the bike I had difficulty engaging the right pedal. I had to pedal with only my left leg and was so focused on my right pedal that I almost crashed into a bike on the right shoulder of the road. Eventually I got it to engage solidly, and I was off. I was breathing so heavily that my sunglasses kept fogging up, and I was going east into the sun so I couldn’t see anything and had to eventually hold my sunglasses as I pedaled. I passed a few people, but then it seemed like everyone was passing me. 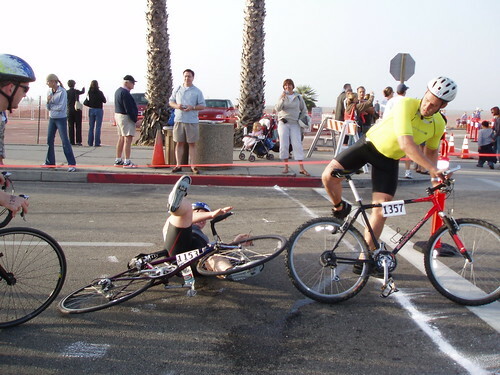 It made me feel good when a guy in a really tricked out tri bike would pass me because I figured, well, he must be an experienced triathlte and at least I beat him in the swim. I thought that until the 50 and 60 year old guys started to pass me. I could tell everyone's ages, because it was written in marker on everyone's calves. These older guys were in a later wave, and I had a 12 minute lead on them! Oh well. There was one guy who was obviously a newbie like me, and he was in my age group. It seemed like we kept passing each other. That was fun. On the way back there was a short but steep hill. Nothing I couldn’t handle, but I did have to shift down to my granny gear. At the top of the hill I was just wiped. I was literally cheering myself on out loud. I stammered, “Paul, get it in gear! Come on! go! …” Luckily there was a down-hill and I love down-hills. Time to pass a bunch of people. I was a pack up other riders as we came into the transition area again. There was one guy ahead of me and few behind me. I unclipped the right foot and placed it on the ground, but I couldn’t get the left foot unclipped. Anticipating unclipping my left foot, I had already began to shift my weight to the left. . . so I just feel right over. I almost took out the guy in front of me as well. Luckily, my wife was right there to document the embarrassing event. Fortunately I was not hurt. I just bruised my hand and my thigh. I could hear people, particularly my wife, call out, “It’s ok. Just keep going!” So that is what I did. I didn’t look around. I just jumped up and ran into the transition area. Total time for the bike portion was 22 minutes and 6 seconds. That was 182nd out of 294 participants (62 percentile). T2 was lightning fast. I used lock laces on my shoes, so it was just a matter of taking my helmet and biking shoes off and putting my visor, race belt and running shoes on. Oh, and a quick swig of water. Total time was 1 minute and 23 seconds. My heart rate was under control on the run, but I really felt tired. I just kept telling myself that I would let myself slow down, but not stop or walk. After the first half mile I was feeling better and tried to push up the pace. I just had to keep a consistent pace. There were some really fast woman who were passing me like I was standing still, but mostly I was back with the older guys. The run was a short two mile. On the way back I had to run through the transition area to get to the finish line, and I started to sprint as I entered the transition area. That was probably too soon, because the transition area was really long. I was dying as I approached the finish line and almost had to stop, but I just could not bear to stop so close. I finally crossed the finish line and was just elated. I was on top of the world! Total run time for two miles was 21 minutes and 43 seconds, which was 241st out of 294 (82 percentile! Ugh, I really need to work on that run. But at least I wasn’t last!) Overall, I finished in 1 hour, 1 minute and 14 seconds which was 197th (67 percentile) and 24th out of 28 racers of my age group. That was actually better than I expected. My goal for this race was just to finish, but I did do a calculation of how long I thought it might take for me to finish, and I figured an hour would be a really great time for me. Well, I just about did it. Here is the heart rate chart of the race. You can see that my rate during the swim was relatively low, but it went really high out of the water. My rate was mostly under control in the bike but would go crazy on the hills. I finally got it under control in the run, where it was nice and flat. Great job Triathlete! Loved the race report! Your wife got some great photos. I'm glad you had a good time. 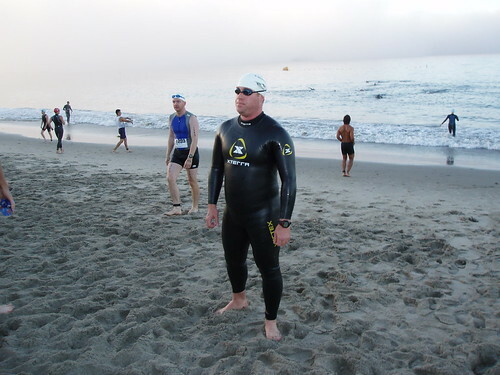 I sure would like to get out to Cali some time and do a triathlon there. Living deep in the dessert I have yet to do an ocean swim. Great job, and great report! Glad to see your hard work has paid off! Glad to hear you're keeping at the Tri! Awesome. Puts me to shame and my only excuse is that Beijing has even more pollution than LA. Congratulations on completing your Triathalon. After reading your account, I felt like I'd been there. Great job!